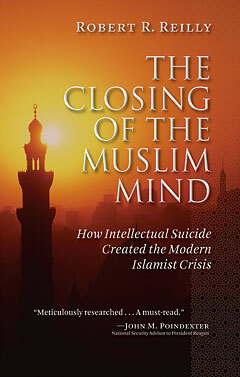 DUNN LORING, VA —Robert R. Reilly’s The Closing of the Muslim Mind: How Intellectual Suicide Created the Modern Islamist (ISI Books, May 2010) will, I am sure, fascinate other readers as it did me. I could hardly put it down until I’d read it twice. Reilly (a dear friend of mine, by the way) contends that Islam suffers from a flawed metaphysic that deforms its theology. It rejects reason and exalts will. It has no room for natural law: Murder is not wrong by definition but only because Allah chooses to forbid it. If he’d decided to enjoin it, it would have become our duty. Islam understands his omnipotence to mean that he is superior to reason itself (thus, if he said that two and two make five, so it would be). Allah’s will is the direct cause of everything; no need to look for secondary causes. No wonder, given this primitive conception of nature, Islam rejects Western science. Allah’s will accounts for everything that happens. The world continues to exist because he recreates it continuously from moment to moment. He could decide to annihilate it at any time. One noted atheist, the Marxist Christopher Hitchens, ridicules the very conception of God as that of a “celestial dictator” — a Stalin in the sky, as it were. But Christians address God as “Our Father.” Far from being a cruel deity who inflicts suffering on his creatures, he is a God who chooses to suffer himself. This is why G.K. Chesterton remarked that Christianity is unique among religions in ascribing courage to God. The Creator became a creature. Why would the omnipotent, impassive Allah need courage? Nobody could nail HIM to a cross. To Muslims, the Christian concept of a triune, incarnate God, insulted, tortured, and murdered by his own creatures seems blasphemous. The primal Muslim error about God’s nature has led, Reilly argues, to a deep stultification of Arab culture for roughly the last millennium. He cites Hilaire Belloc’s 1938 prediction that the Muslim world would once more surpass Christendom, if only it adopted Western technology. But Reilly’s own argument makes this hard to believe: Islam’s long hostility to reason has turned it into a virtual superstition, impenetrable to the practical and theoretical science that the fulfillment of Belloc’s prophecy would require. You can’t very well build modern weaponry if you don’t believe in efficient causes. Islam seems doomed to remain backward and futile, dissipating its energy in bursts of violence and hysteria. I have another small bone to pick with this superb and stimulating book. Reilly speaks of Islam as “totalitarian”; I agree with him about its tyrannical potential, but I would reserve the word for regimes (especially communist ones) in which the will of the ruler may change suddenly and arbitrarily (think of Mao, Castro, and Kim Jong-Il), whereas Islamic rulers are bound by the fixed text of the Koran. On the whole, I find this book reassuring. It makes me more grateful than ever to be a Christian and more doubtful than ever that Islam can ever pose a serious threat to the West, any more than numerology can threaten calculus, or Ptolemaic astronomy overthrow Copernican. As Macbeth says, that will never be! Islam may remain an irritation to the West for centuries yet, but not a fundamental danger. The real danger is our own apostasy (as Belloc rightly warned us), which has already done so much more harm than Islam ever could. Islam, one might say, has lobotomized itself. Will Durant once wrote that John Calvin had given us “the most absurd and blasphemous concept of God in the long and honored history of nonsense.” No; that distinction belongs to Muhammad. In less than a month, Reilly’s small book has earned a place near the top of the tiny library of books I regard as indispensable. How did I live so many years without it?